Sales and sales training have been our guest, Deb Calvert's, passion since she was a child earning money for extra weeks at summer camp. You need to catch the beginning of this show to hear how she was originally motivated to get into sales. She talked about 8 reasons we'd ever ask a question are summarized in DISCOVER (this is an acronym). Most sales people only ask questions for 3-4 reasons. If you open it up to all 8, you open yourself up to be of real value in the conversation and prospects will share the same with you. She has a great book: DISCOVER Questions(tm) Get You Connected – LISTENER SPECIAL! BOOKMARK this page. It is continuously updated. Some of what she and Matt are talking about the survey that asks you "When were you at your personal best?" This goes through March. This is how she gathers valuable information. Deb Calvert, “DISCOVER Questions® Get You Connected” author, Top 50 Sales Influencer, UC-Berkeley instructor. 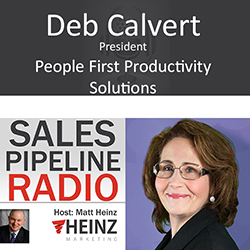 Deb leads the Stop Selling & Start Leading movement and offers sales training, coaching and leadership development programs. Deb is certified as an executive and sales coach and is a Certified Master of The Leadership Challenge®.